East meets West in a clash of titans! I must begin by saying that the nature of this review will be different than my previous one, Attack on Titan: Lost Girls, in the respect that that review consisted of two books that made up a duology. As with any other anthology collection, Attack on Titan: Anthology is comprised of several individual mini comics that make up the greater whole. That being said, let’s go! Ok. This one was especially fun to read! Like many other fans of manga, I also enjoy reading comic books. Those nearest and dearest to me know that I throw in my allegiance with DC. The world’s fiercest Amazon princess, Wonder Woman, is my all-time favorite superhero, though she shares the top spot with Gotham’s Dark Knight, Batman. I do not mention this so that I have an opportunity to throw out some of my interests. I do so because it is beyond refreshing to see the West’s take on something that is massively popular in a culture that has its own unique style of illustration. Say what you will, but America is inundated on all sides by different aspects of Asian culture. Though it is diametrically different from our own, many of the Asian culture’s creative outlets are similar to ones that we are familiar with. In this case, the similarity manifests in the form of illustration. So, when I say that I was beyond excited to receive this volume, I truly mean it. I was over the moon! Within the binding of this book, the reader can find the creative adaptations of the Attack on Titan world made by Western comic book artists and authors from both sides of the aisle—Marvel and DC. 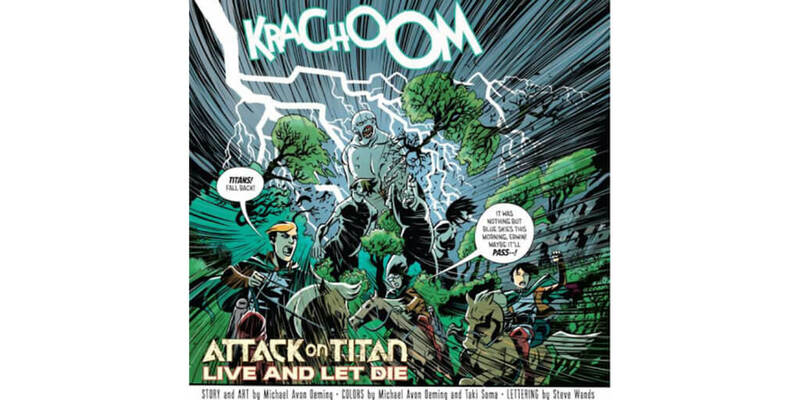 Creative geniuses from America and Europe who have worked on the development of Batman (Scott Synder), Catwoman (Genevieve Valentine), Wonder Woman (Gail Simone and Phil Jimenez), Powers (Michael Avon Oeming), and other fantastic characters have been influenced by the popularity of Attack on Titan. As I mentioned, I am a fan of Wonder Woman, so I was stoked to see that Gail Simone had a hand in one of the comics. 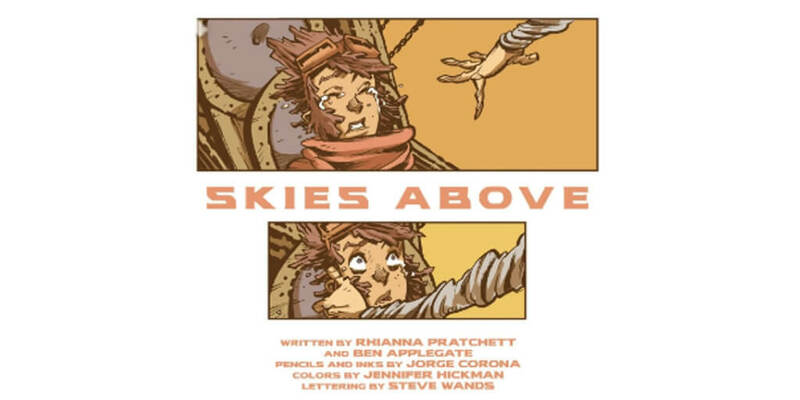 I was also excited to see video game writer Rhianna Pratchett had written another of the comics featured in this book. For those who are not in the know, Rhianna is the daughter of English author Terry Pratchett, who was the creator of the Discworld series. In addition to several other video games, she was the writer for Tomb Raider (2013) and Rise of the Tomb Raider (2015). Now, that, my friends, is the bomb! There are so many to choose from, but some of the stand-out comics for me are: Under the Surface (Scott Snyder), An Illustrated Guide to the Glorious Walled Cities (Genevieve Valentine), Good Dog (Gail Simone and Phil Jimenez), Skies Above (Rhianna Pratchett), and Live and Let Die (Michael Avon Oeming). In Under the Surface, the reader is immediately thrust into a gritty story that alludes to some kind of global disaster where all kinds of Hell is breaking loose. It is only through further reading that it becomes apparent that this is a unique take on what could be considered a pre-apocalyptic origin story for Attack on Titan. I feel that it is the perfect choice of comic to introduce the reader to the fantastical worlds of the anthology. 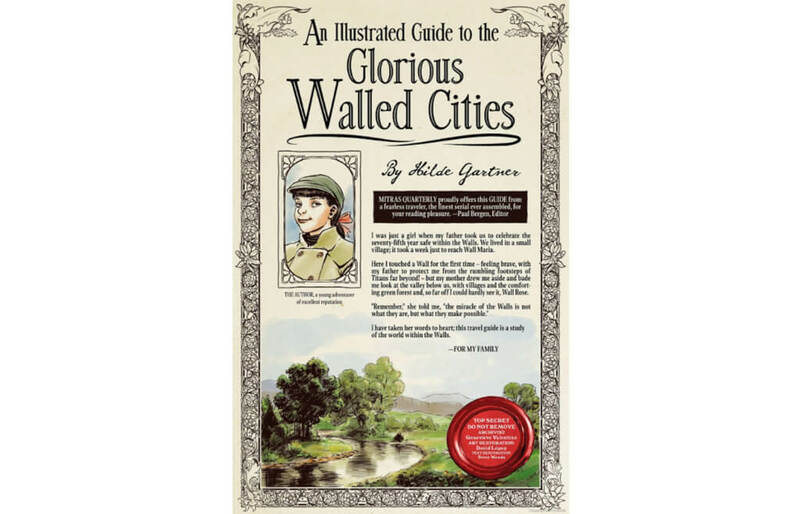 An Illustrated Guide to the Glorious Walled Cities reminds me of the information that would appear during the eye-catch of each episode of the Attack on Titan anime. In this case, it has more of the feel of an illustrated primer, offering a glimpse into an aspect of life in the walled cities that is otherwise overlooked in the greater scheme of it all. Each mini segment was a treat to encounter in between other comics. 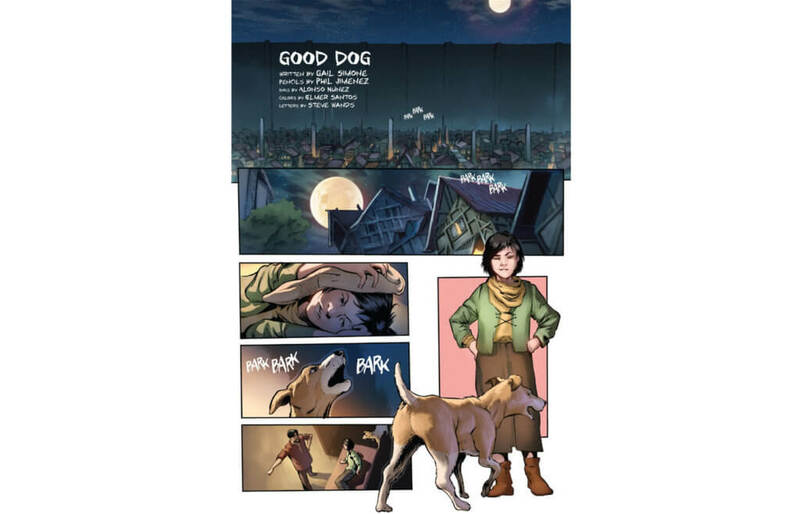 In my opinion, I felt Good Dog was one of the most powerful comics. I say this with no bias because Gail Simone’s and Phil Jimenez’s list of projects includes Wonder Woman, but rather because the segment is illustrated in a way that it paints a complete story without the use of words. Between Simone’s concept and Jimenez’s beautiful illustrations, the reader has no difficulty following the flow of the narrative. Rhianna Pratchett’s Skies Above is a treatise to the indomitable human spirit. Illustrated by Jorge Corona, it is one of the more lengthy comics and has some of the most character development. The illustration style is a little unconventional, but do not let that discourage you! Live and Let Die is the embodiment of the essence of the Attack on Titan world. Fans of the anime know that in a world of uncertainty, the only thing one can be certain about is that no one is safe. Live and Let Die captures what life is like for those who seek to eek out a miserable existence living in a world overrun by titans. Honestly, I do not have anything bad to say about this volume. As an artist, I can appreciate the various techniques and styles that are unique to those who worked on the shorts contained in the book. If the reader is a fan of a certain aesthetic, then he or she may not be too keen on some of the illustrations; however, I would still encourage them to read it. You would be missing out if you did not! Another complaint that could be expected would be the brevity of each segment. My reaction to some of the comics was, “WHAT?! That’s it? !” I feel that I should go on to say that this is a typical reaction for me to everything that ends in a cliffhanger or concludes before I am ready for it to—especially newly released anime. Unlike said anime coming out every week, the stories found within this anthology are not meant to be continued. To me, I would not view it as anything negative. This is the whole essence of what makes it an anthology. These are all just snippets of a world that these artists have envisioned for us to enjoy, and I truly did enjoy them! Attack on Titan: Anthology is a really fun read. For me, it is a happy blending of two worlds that I enjoy—manga and Western comic book heroes. I feel that fans of either topic would appreciate this volume. I, for one, look forward to future endeavors of Western artists’ adaptions of Eastern culture. Again, many thanks to Kodansha for providing Attack on Titan: Anthology to Yatta-Tachi. If you would like to read the anthology, you can find it through Kodansha, Penguin Random House, or at your preferred bookstore. Where can I watch Attack On Titan Season 2?